Evaluation of qualitative parameters of transmission on the physical and higher layers of communication. Methods for evaluating quality of voice and data services, particularly for packet networks. Modeling and measuring parameters of metallic lines and optical fibers in the last mile. Topology optimization and methods of transmission in Digital Subscriber Lines, Passive Optical Networks (PON), and hybrid networks. 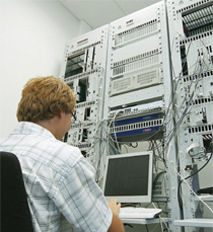 Wavelength Division Multiplexing systems, optical amplifiers, Optical Add Drop Multiplexers, optical packet switching. Modeling and measurement of fiber optic backbone networks, dispersion compensation, implementation of advanced multi-level modulations. Modeling the parameters of high power lines at high and low voltage, topology optimization, transfer methods optimization for narrowband and broadband systems.